On the left-hand wall of the inner corridor, at (c), Rekhmire supervises the delivery of grain, wine and cloth from the royal storehouses. He inspects carpenters, leathcr-workers, metalworkers and potters, who all come under his control. In the lower row is a record of the construction of an entrance portal to the temple of Amon at Karnak showing that Rekhmire supervised the manufacture of the bricks and each stage of the construction. 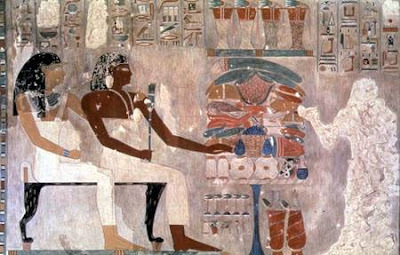 On the right-hand wall (d) Rekhmire may be seen at a table, and there are scenes of offerings before statues of the deceased, the deceased in a boat on a pond being towed by men on the bank, and a banquet with musicians and singers. 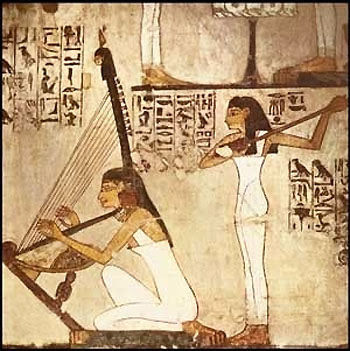 All the representations in this tomb show rhythm. Workers bend to mix mortar or squat to carve a statue. A man raises a bucket to his colleague’s shoulder. Another is engrossed in carpentry. The elegant ladies of Rekhmire’s household prepare for a social function with young female attendants arranging their hair, anointing their limbs or bringing them jewellery.